Compared to the weapons training that military and law enforcement personnel undergo, the training required of civilian gun owners is a joke. The U.S. military has a lot of guns, but not a lot of non-combat fatalities. Why is this? Because of common sense military regulations. That’s why, like many other military veterans, I view America’s civilian gun culture as dysfunctional. Today, Americans mourn yet another tragic mass shooting, this one in a Texas high school. It has been a mere three months since 17 teens lost their lives at Marjory Stoneman Douglas High School in Florida. Much has been made of U.S. gun control laws — or lack thereof. But instead of listening to politicians battle across the partisan divide, we should be listening to the men and women who work with guns the most. Instead of listening to politicians battle across the partisan divide, we should be listening to the people who work with guns on a daily basis. Most Americans would be surprised, for example, at how little time military personnel in particular spend with their weapons over the course of a career. Apart from firing on highly structured firing ranges or routine maintenance, access to your weapon on base is rare. Military Police provide security, so soldiers move about the base unarmed. There’s a reason for this: In the military, anything that reduces accidents, homicides or suicides isn’t put up for a vote. It’s a requirement. The military’s strict rules on weapon and ammunition access can apply to wartime as well, as my own experience demonstrates. In 1991, I was a military intelligence officer in the U.S. Army Reserve. My unit was mobilized and sent to Fort Bragg, N.C. Shortly before boarding a plane to Saudi Arabia I was issued my M16 along with several magazines of live ammunition. Although I had fired countless live rounds over the years on various military weapons ranges, it’s a different feeling when you’re issued live ammunition before heading to a combat zone. This time it was real. That’s right. Once we arrived in an operational war zone, one of the first things the U.S. Army did was take our ammunition away. After a 16-hour trip — most of which I spent sitting on the hood of a truck with my back against the windshield trying to stay warm — we emerged into the intense desert heat. Because of the ear-splitting noise of departing jets we quickly inserted hearing protection, and then surrendered our ammunition. We were in a location where small-arms engagement with enemy forces was unlikely, so, as far as the Army was concerned, there was no need for a bunch of wound-up soldiers to be walking around with live rounds. Even without any ammunition, before entering a building every soldier had to demonstrate his or her weapon was empty by pointing it down toward a barrel of sand and pulling the trigger, causing it to make the “click” sound of an empty weapon (hopefully). Eventually, my unit moved north toward Kuwait, where we were re-issued ammunition just before the start of the ground war. Several weeks later, after successfully completing our mission in Kuwait City, we were re-routed to northern Iraq to address the Kurdish refugee crisis. On arrival, we once again surrendered our ammunition. These military safety requirements are a stark contrast to civilian U.S. gun laws. Where the military requires background checks before a service member is allowed anywhere near a live weapon, the majority of U.S. states allow private gun sales without a background check. Where military personnel are trained to take a weapon away from a soldier who poses an extreme risk to himself or others, most states do not have laws enabling law enforcement or loved ones to do the same. Compared to the weapons training that military and law enforcement personnel undergo, the training required of civilian gun owners is a joke — if it exists at all. Before I was sent out to use it, I had to prove an intimate familiarity with my weapon — how it worked, its maximum effective range in meters, how to load and unload it safely, how to disassemble and reassemble it, how to clean it, clear jams, sight it and fire it accurately. So it’s hard for me to fathom how easy it is for almost any civilian to walk out of a gun retailer carrying a new weapon without a clue about so many of these standards. And where military and law enforcement undergo extensive training on how to make the right shooting decision quickly while under extreme stress, civilians receive no such training, contributing to avoidable deaths arising from poor decisions and petty disputes. In this context, the National Rifle Association’s favorite slogan about good guys with guns defeating bad guys with guns is more naive myth than solution. It’s crucial that veterans now bring our voice and experience to the national conversation about reasonable gun reform. As a group, we understand guns and appreciate that responsible gun ownership is an important part of American life — but we also understand that a safe environment is achieved through training and regulation. We fought to protect our country, yet see our fellow citizens being gunned down in schools, churches, restaurants and concert venues at a rate unseen anywhere else in the developed world. More Americans have been killed by guns since 1968 than in all of the wars in U.S. history. It’s ridiculous and tragic. As a veteran, I am often asked what lessons the civilian world can learn from the military. There are many insights each can gain from the other. 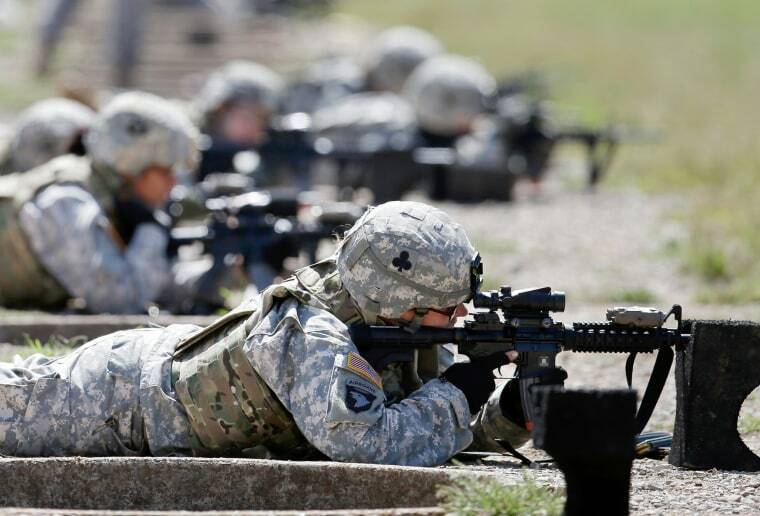 When it comes to guns, however, the greater wisdom lies with the military. It maintains a high-functioning gun environment because it remains serious about background checks, training and accountability. It is time for the civilian world to do the same. Michael E. Diamond served as a military intelligence officer in the United States Army Reserve for seven years. Michael E. Diamond is a military veteran and a member of the Everytown for Gun Safety Veterans Advisory Council.